This is a recipe that I found in the Mennonite Treasury, and to my delight, it was Gluten Free. This chocolate sponge cake is light and airy. There is no flour, no added fat, low in sugar, and if you want you can use a low fat whipped topping in place of the whipped cream, which then makes it possible to enjoy two pieces....smile. 1 1/2 cups of whipping cream whipped (save about 1/2 cup of the whipped cream for the outside of the cake). Lightly grease and line a 10x15 inch cookie sheet that has sides with wax paper, then lightly grease the top side of wax paper. (it will peel off easily after baking). Beat the eggs whites till stiff peaks form. Beat the egg yolks til light in color, slowly adding the sugar, cocoa, and vanilla, this takes about 10 minutes, you want it to be very light and more than double in volume, this is what gives the cake the light texture. Combine the egg whites with the egg yolks by gently folding it in as to not reduce the volume. Bake for about 12-15 minutes, cake is ready when it springs back and looses the shine. Sift more icing sugar thickly on another piece of wax paper. A bit larger than the cake. Cool cake for 5 minutes and then flip over cake onto the wax paper with the icing sugar. Very carefully try to peel away the wax paper. Don't worry if cake cracks or tears a bit, the whipped cream covers it. 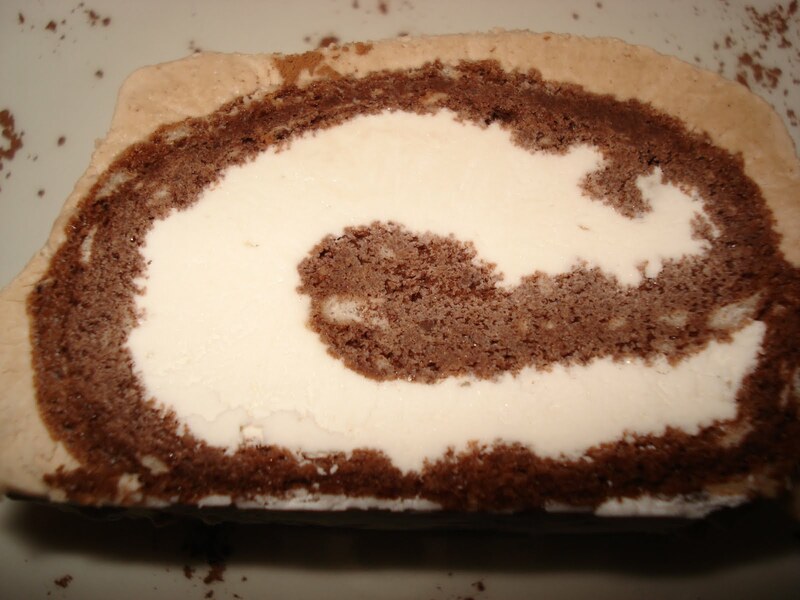 Roll up the cake and let it cool completely. Unroll and fill with the whipped cream, saving about a generous half a cup for frosting the outside. I added 1 tablespoon of cocoa to that just for a variation. Freeze the cake (optional) or serve cold from the fridge. Oh wow, great find, Charlotte! Who would have thought that the Mennonite Treasury would have a GF recipe in it! Nice! This looks delicious. I am a diabetic. Love that you posted a recipe, a chocolate recipe even, that I can enjoy and my family will love! Thank you. Oooh! It reminds me of the "Yule Log" cakes my family makes for Christmas! But gluten free! this looks great. Does it need to be wax paper? Can parchment paper work as well? That looks so great! I have never made one of these before but now I am going to try it. Now if it was calorie free..I could even eat it. Thanks for the recipe. This one I have made and it is good.The Mennonite Treasury is one of my many cookbooks. regarding your question about the parchment paper. i did use parchment and found it a bit difficult to peel off....perhaps if i had oiled it a bit it would have been fine.in the past i had always used wax paper. my mom, and several of the other mgcc gals feel that lightly greased wax paper is the way to go. that is how we suggest it in the recipe book. if you find good success with lightly greased parchment paper let me know, and post it in the comments here. Yummy Char.. when are we finaly going to eat at your place?? My dil to be is celiac so this one will be going on my list for gluten free desserts.